What are the steps in well construction? What is the architecture of a well? How is the price of a well determined? After the bore hole is drilled, casing is placed down its center. The bottom lengths of casing are perforated and screened to allow the water to flow inside them. 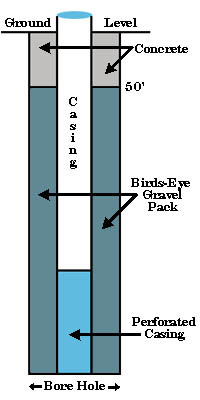 Birds-eye gravel is packed around the casing to a level of 50 feet from ground level. The top 50 feet are filled with cement to seal the well from surface contaminants. The price of a well is determined by a number of factors: the geographical area, the expected well depth, and the geological study. Some areas contain strata with bedrock which requires more drilling time and drill bits. 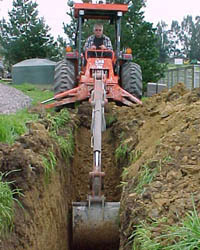 Other areas may have strata with little or no water sources making the needed depth much greater. Pricing of the well is done with the customer at the well site. The price is calculated by the following formula. Our prices do not include the price of the pump, pump installation and wiring.